Concrete Stain Color Chart See samples of popular color choices for staining concrete floors and outdoor surfaces. Staining Product Reviews Get an inside look at the latest stains and application equipment. Concrete Stain Costs Get an overview of prices for acid and water-based stains, dyes and sprayers. Newer products on the market-such as water- and solvent-based dyes-are greatly expanding the artist's palette with colors ranging from soft pastels to vivid reds, oranges, yellows, and purples. And in some cases, these newer stain products are easier and safer to apply. Concrete stains are a mixture of water, hydrochloric acid, and acid-soluble metallic salts. Because of concrete's porous qualities, they penetrate and react chemically in the concrete. Concrete stains become a permanent part of the concrete. They're known for their durability and long-lasting color because concrete stains will not fade, chip, or peel off. Concrete stains are also known for their translucent color. Because of the various conditions of concrete surfaces, concrete stains react differently creating one-of-a-kind color and patterning. Whether new or old, concrete of any age can be stained. The concrete staining process will vary depending on the type of stain used, whether it’s being applied indoors or outdoors, and the effect you desire. Always follow the specific instructions provided with the stain you are using. Learning how to stain concrete is easy if you are a professional who’s already familiar with concrete, if you are a DIY homeowner, it will be more challenging, but not impossible. Make sure you thoroughly understand the process before attempting to stain concrete or else you may end up with disappointing results. The sky is the limit when it comes to concrete stain colors. Acid stains offer a variety of variegated earth tones, while water-based stains offer a broader range of hues, including black, white, yellow and orange. Additionally, many experienced concrete stain applicators will blend colors to create custom shades. Various colors of stain are applied using small brush to create a detailed design. Many contractors also use sawcuts to create unique patterns on concrete floors or patios that can then be stained multiple colors. The cuts prevent the stains from bleeding into one another and mixing. Stencils made for use on concrete can also be used for creating impressive designs with concrete stains. Acid stains work by chemically reacting with the concrete to change its color and can be used both indoors and outdoors. The primary benefit of acid stains is that once the reaction is complete the color is permanent and won't fade, chip off, or peel away. Acid stains are translucent and produce a unique look every time depending on the condition of the concrete. The colors are limited primarily to earth tones and the acid in the stain must be neutralized to stop the reaction. Water-based concrete stains are a newer, non-reactive option for staining concrete. Like acid stains they are UV stable and can be used indoors and outdoors, but unlike acid stains they offer a full spectrum of colors with longer working times. 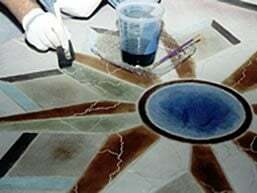 Additionally, water-based stains impart a more consistent color (as opposed to the strong variegation of acids stains). Many staining pros like using water-based stains because they are safer to apply, have faster drying times, are low in VOCs, and save time and labor. Most non-reactive stains call for acid washing to open and prepare the concrete surface to ensure good adhesion. Outdoors concrete stain is often applied with a sprayer. Staining is the most affordable and quickest way to transform exterior concrete. In just a couple of days you can take a boring gray slab and transform it into a beautiful stained concrete patio, driveway or pool deck. Typically, acid stains are a more durable choice for exterior concrete stain projects than water-based formulas. However, water-based stains will do fine outside if re-sealed frequently. Ultimately, choosing the best outdoor concrete stain comes down to the desired color and look. 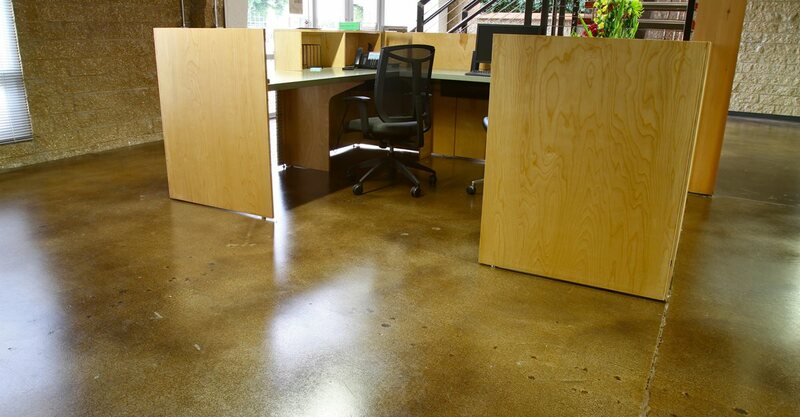 Stained concrete floors make beautiful additions to the interiors of homes and businesses alike. When selecting an interior concrete stain keep in mind that acid-based stains are good for high traffic floors due to their longevity, while water-based stains are easier to apply, require less cleanup and aren’t as toxic. Acid stained concrete floors have an old-world mottled look that blends well with stone and wood and helps bring a timeless appeal to your indoor spaces. Concrete floors colored with water-based stains will have more vivid, consistent coloring suitable to more modern interior designs. SHOULD I USE A STAIN, PAINT OR DYE? Stains penetrate the surface of the concrete creating long-lasting color that won’t chip, peel or fade. 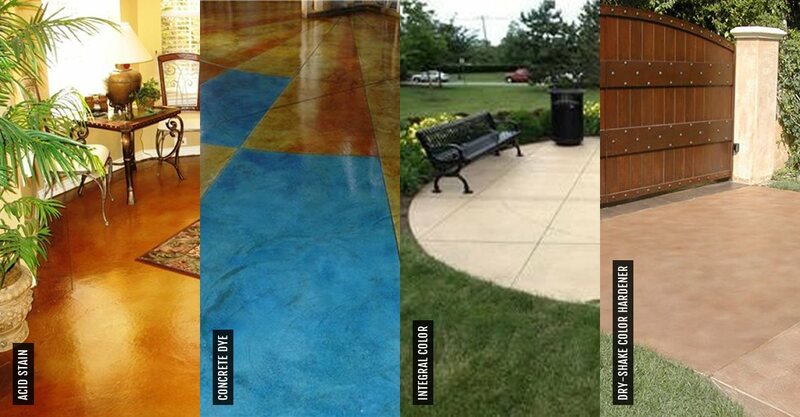 Commonly available in earth tones, stains impart rich, translucent, variegated color to indoor or outdoor concrete. Imperfections or stains on the concrete often show through, even after multiple coats of stain are applied. Many see this as part of the rustic charm of concrete stains. Tip: Choose stains if you enjoy a natural look and want something that will last for years. Concrete paint coats the surface, creating a layer of color that will eventually wear away. Paint is much more susceptible to peeling, chipping and fading. Unlike stains, paint imparts solid and consistent color. Paint can be used indoors or outdoors. Tip: Choose paint if your concrete is badly stained and you’d like to cover the imperfections. Concrete dyes offer vibrant color choices such as yellow, blue and purple. They are often used in conjunction with stains to further enhance the final color. Like stains, dyes impart transparent color, but they dry quicker than stains and do not require as much cleanup. Dyes are popular for adding color to polished concrete, but aren’t used often outdoors because they aren’t UV stable. Tip: Choose dyes if you want vibrant color and are looking for a fast turnaround. The concrete stains with the best reviews tend to be professional grade, not the type you can buy at your local hardware store. Professional grade stains can be ordered online through specialized companies, or purchased at your local concrete supply store. CAN NEW CONCRETE BE STAINED? New concrete can be stained after it has had time to fully cure. This will vary depending on the circumstances, but average curing time is 28 days. Warmer temperatures and stiffer concrete mix can lead to faster cure times, while cooler temperatures and a wetter mix can delay the process. Some stain manufacturers suggest waiting until the concrete is all one uniform color. Knowing some tricks of the trade is always helpful when starting a concrete staining project. Make sure to read the instructions that come with the stain you are using before getting started. If you are unhappy with the color of your stained concrete or you’d like to refresh concrete that was stained long ago, there are a few options. 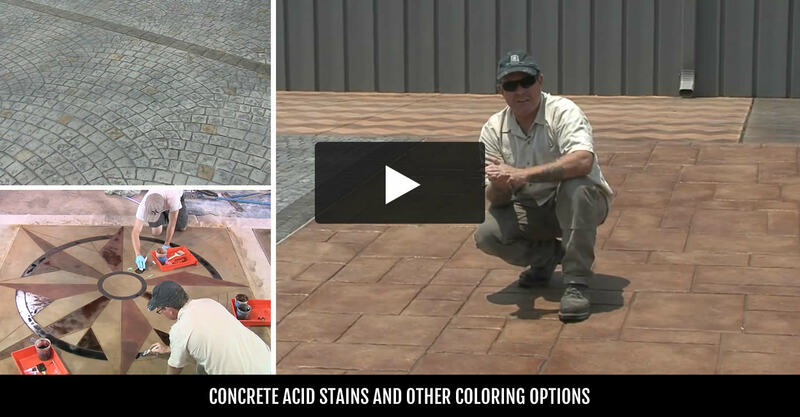 Water-based stains or dyes are great for restoring color to faded concrete. Before restaining it is essential to make sure any remaining sealer has been removed so that the stain can properly bond with the concrete. In general, making a stain color darker can be done easily, but lightening the color is a different story. For this reason many contractors apply multiple layers of diluted stain until they reach the desired color. 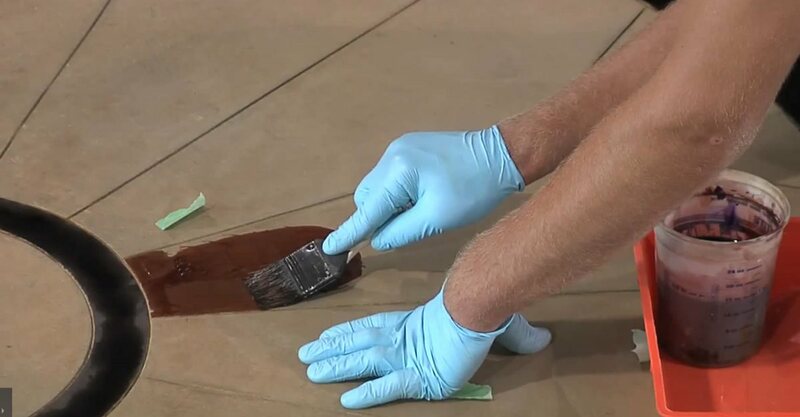 In the case of stain that came out too dark, you can start fresh with an overlay or try to pull the color back out of the concrete with an acidic solution. Yet another option for changing the color of stained concrete is a tinted sealer. Coverage rates are available from stain manufacturers and usually presented in square feet per gallon. 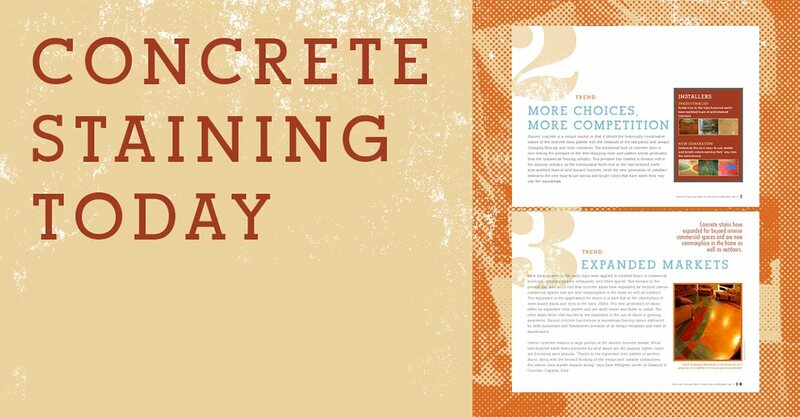 The age and condition of the concrete will impact the coverage rate. More porous concrete will result in a lower coverage rate and thus more stain will be required. On average, acid stains will cover 200 to 400 square feet per gallon, while water based stains will cover slightly more at about 250 to 450 square feet per gallon. Both acid based and water based stains can be diluted to get more coverage, however this will also lessen the intensity of the color. If you plan to apply multiple coats of stain you will need even more. Often the stain will have a better coverage rate on subsequent coats, which means you will need less. HOW LONG DOES IT TAKE FOR CONCRETE STAIN TO DRY? Acid stain will be dry to the touch in 15-20 minutes, but that doesn’t mean the reaction is complete. Most stain manufacturers recommended a dry time of up to 24 hours. Many contractors find that letting stain dry overnight is sufficient and convenient for their schedule. If applying multiple coats of stain, allow for an hour or two of dry time in between. After the stain has dried the acid needs to be rinsed and neutralized. Then there will be a few more hours of waiting for the concrete to dry before applying a sealer. The concrete must be completely dry and free of residue for the sealer to bond well. After the sealer is applied, you should wait at least 24 hours before returning to using the concrete as normal. Overall, the staining and sealing process should take 2 to 3 days. Water based stains dry faster than acid stains and do not require neutralization before sealing. This makes them a great option for fast-track projects.